The deadline to choose options for 2017-2018 grades 7, 8 and 9 students is Monday, June 12. If students do not choose their options by this time, the school may choose the options classes based on availability. Please login to Family Zone and make your choices. Ogden Campus has a wide variety of options courses! No matter what you’re interested in, there’s something for you! Students currently in grades 6, 7, and 8 must log in to Family Zone on specific dates in June (see below) with their parents to choose three options courses for the 2017-2018 school year. Login to Family Zone using your family login information. The system should prompt you to choose options for your child(ren). If it does not, click the Options link on the right.Note: if you do not automatically get sent to the options page, it means you have fees owing. Please pay your fees for 2017-2018 before choosing options. 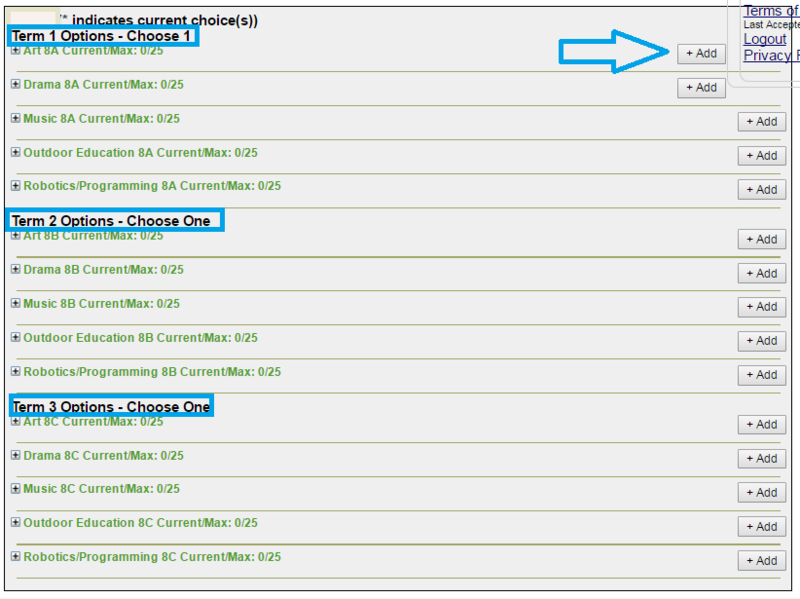 Choose your child’s options courses on by clicking the “+ Add” button beside the option name. A box will appear where you may click OK to confirm your option or CANCEL to change your option. Once you click OK, your option for that term is final. Choose 1 Option per term -> 3 options classes total. Have reviewed your options class choices and the descriptions of your choices. Agree to the learning commitments required by your choices. Options classes are graded. Students are expected to complete all assignments, projects, tests and tasks associated with their chosen options. Are aware that you must choose 3 different options; you may not repeat the same option in one school year. Recognize that once registered on Family Zone, you are not permitted to change your options. Are aware that your option preferences are not guaranteed. Due to scheduling, your options may be chosen by the school. Any student who is not prepared to fully participate in all activities and field trips associated with their chosen option should choose a different option. Art Students will utilize the elements of art including line, texture, color, value, and space. We will focus on Still Life, and Abstract Art. Students will have the opportunity to design, draw, and paint. Students are expected to work hard, try their best, and to improve their skills, in order to achieve good grades in Art class. Click here to view the Alberta Education Art Curriculum. Drama Drama is a unique form of artistic expression whose components lend to a healthy understanding of the individual and society at large. Studying Drama enhances communication skills, vital to the developing student. Through the areas of study, you will practice and develop your dramatic skills within the context of performance. Click here to view the Alberta Education Drama Curriculum. Music The Music program’s goals involve enabling students to; develop skills in listening, performing and using notational systems; strive for musical excellence, individually and as members of groups; understand, evaluate and appreciate a variety of music; develop self-expression, creativity and communication through music; and to be aware of the history of music and the implications of music in our society. Click here to view the Alberta Education Music Curriculum. Outdoor Education The focus of Outdoor Education is to increase students’ enjoyment and knowledge of the outdoors. Over the course of the term, there will be 2-3 field trips (a combination of hiking, paddling, orienteering, archery, snowshoeing, cross-country skiing, trips to city parks). Students will need to pay a $50.00 fee to help offset the cost of these trips. In class, we will learn to safely plan outdoor excursions, handle knives, basic carving projects, shelter setups, and knotcraft. Students will be expected to learn and demonstrate leadership and teamwork skills. 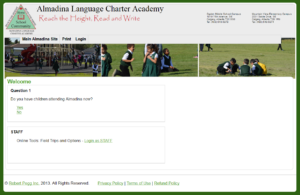 Assessment will be a combination of written work, skill demonstration, and teamwork/participation. Please note that although it is possible to get a very good mark in this class, students do not receive 90%+ just for showing up. Even though this is an options class, students are expected to work hard and earn their mark. Click here to view the Alberta Education Outdoor Education Curriculum. Robotics/Programming Robotics helps students develop knowledge and skills relating to computer technologies in the areas of: systems management, text/data input, productivity software, applied processing, programming, and emerging technologies. Students will improve problem-solving skills while working through challenges. Students will also have an opportunity to design and print the necessary robotics pieces that may not be included in their kits. Students will also develop a basic foundation in computer programming skills. Click here to view the Alberta Education Information and Communication Technology Curriculum. After reading all of the above, click the image below to go to Family Zone. Click the image to go to Family Zone.